Invercauld Estate lies to the south and east of Braemar. 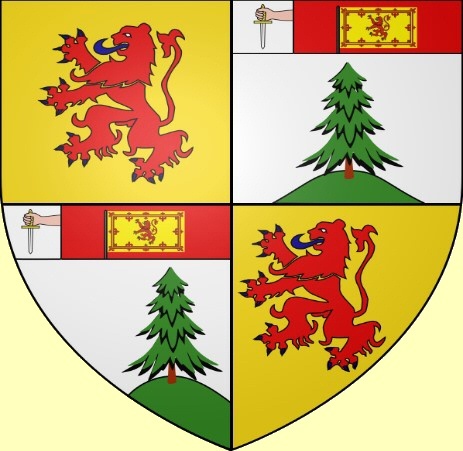 The Farquharsons originate from Farquhar son of Shaw (alias Mackintosh), who emigrated from Rothiemurchus in the 1400’s. Farquhar’s grandson was Finlay Mor Farquharson (1480-1547), treated as father of the clan. Between 1440-1565, the lands of the earldom of Mar (who previously owned the area), were in the hands of the Crown, and in 1539 Finlay Mor Farquharson was registered as sole tenant of Invercauld. Finlay’s father Donald married Isobel Stewart, heiress of Invercauld, and it is presumed this is how Invercauld (which was already an old castle) came into Farquharson possession. Finlay Mor died in the Battle of Pinkie, fighting for the Jacobites. His sons spread far and wide, and several of their descendants, including the Farquharsons of Invercauld, still own and farm land in Northeast Scotland. 1628 saw the completion of the building of Braemar Castle by John Erskine, 18th Earl of Mar, primarily to keep the nearby Farquharsons in check. In 1689 John Farquharson of Inverey and Balmoral, nicknamed ‘the Black Colonel’ on account of his dark complexion and close association with Viscount Dundee’s army, attacked and burned down Braemar Castle. John Farquharson (1673-1750), 9th Laird of Invercauld, bought the ruined castle and years later, in 1748, leased it to the government to house Hanovarian troops. In the 18th century the Farquharsons were eventually able to purchase their possession rights to the land, from the Crown, after the attainder of the Earls of Mar, as a result of the Jacobite uprising of 1715. During the tenancy of James Farquharson (10th Laird of Invercauld) over fourteen million trees were planted on the Estate. During the this time much work was carried out constructing and improving the residential buildings. The Farquharsons of Balmoral sold up and Queen Victoria bought the land. Invercauld Castle in particular was extended in the Victorian style with obvious influences from the neighbouring brand new Balmoral. This was the great age of grouse shooting and deer stalking with record grouse bags being taken in the 1920’s. The present 16th Laird Captain Alwyne Farquharson assumed the title in 1941 when his Aunt Myrtle Farquharson was killed in a London bombing raid. A major portion of the grouse moors were let on a long term basis to HM the King, latterly the Queen and the Prince of Wales. Today the Estate is run as a modern business owned by Family Trusts under the guidance of Captain Farquharson and other members of his family. Braemar Castle is on a long lease to the Community of Braemar, a charity which keeps the castle open to the public. Salmon fishing, grouse shooting, deer stalking, as well as skiing, forestry and tourism all form parts of the diverse management of Invercauld Estate. Book by Geoffrey Farquharson, 2005, entitled ‘Clan Farquharson; a History’. 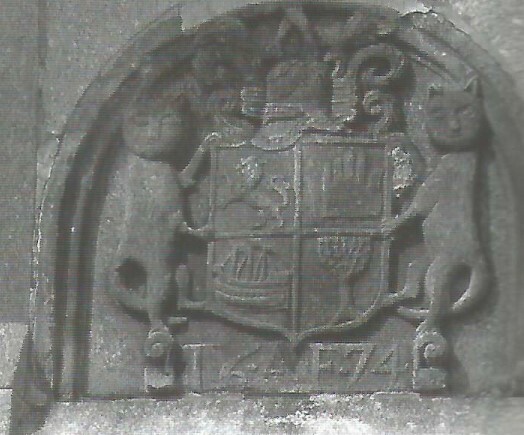 Shield on Invercauld House, when Alexander Farquharson made alterations to the house in 1674.